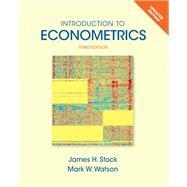 by Stock, James H.; Watson, Mark W.
Note: You are purchasing a standalone product; MyEconLab does not come packaged with this content. If you would like to purchase both the physical text and MyEconLab search for ISBN-10: 0133595420 ISBN-13: 9780133595420. That package includes ISBN-10: 0133486877 /ISBN-13: 9780133486872 and ISBN-10: 0133487679/ ISBN-13: 9780133487671.